Toddler parenting is no joke. And occasionally I need an afternoon cup of coffee to keep up with my busy boy. That’s why I love our Keurig. It’s easy to brew just one cup — whether I’m in the mood for a traditional house blend or a seasonal pumpkin spice or my favorite hazelnut. Last Friday, my little sidekick and I traveled to the Giant Eagle Market District in Robinson for a mid-day coffee break. Italian Barista Champion Francesco Sanapo was there to tell us about the new Barista Prima K-Cups, which are stronger and darker than most K-Cups I have tried. I am not typically a fan of bold coffee blends — especially when served black — but Francesco made me a believer. (Perhaps it was his thick Italian accent and romantic descriptors like “subtle hints of bittersweet chocolate” and “robust with berry notes.”) Also, it didn’t hurt that his coffees were paired with sweets from Chef Maureen Joyce of Bella Christie and Lil’ Z’s Sweet Boutique. The next morning we baked a batch of Duffins and brewed two cups of Barista Prima coffee in the comfort of our own kitchen. That’s the beauty of K-Cups. 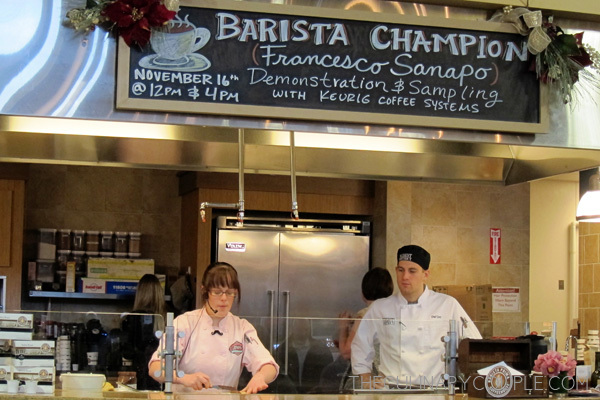 You can be an Italian Barista Champion, too. Also, you don’t have to worry about your toddler crawling under bistro tables while you try to sip your hot coffee. 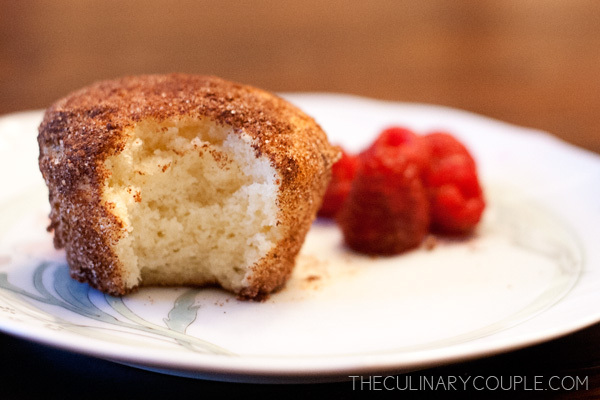 The Duffins are dense like doughnuts, but baked in muffin form. And as if that doesn’t sound delicious enough, just wait until you dunk them in melted butter and roll them in cinnamon and sugar. These sweet treats pair well with a medium-dark roast, and the addition of almond extract compliments the toasted nutty finish of the Barista Prima House Blend. 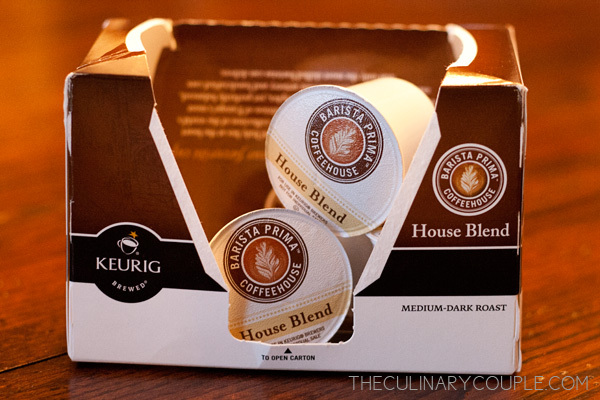 And guess what … the fine folks from Barista Prima Coffeehouse would like to share a box of their House Blend K-Cups with one lucky reader! Just leave a comment below and tell us: What’s your favorite sweet treat to pair with a cup of coffee? I did not receive any monetary compensation for this post. I did receive this product free for review. To enter, leave a comment below and tell us: What’s your favorite sweet treat to pair with a cup of coffee? Giveaway ends Wednesday, Nov. 21st at noon. Don’t forget to include your e-mail address with your entry so we can contact you if you win. Preheat oven to 350°F. Lightly grease a 12-muffin tin. In a large bowl, beat together sugar and egg until light and fluffy. Add oil, milk, vanilla, and almond extracts. Mix to combine. In a separate small bowl, sift together flour, baking powder, and salt. Pour into the egg mixture and stir well. Divide batter evenly among 12 cups, filling each about half full. Bake for 15 minutes, until toothpick comes out clean. While muffins are baking, melt butter in a small bowl. Combine cinnamon and sugar in another small bowl. 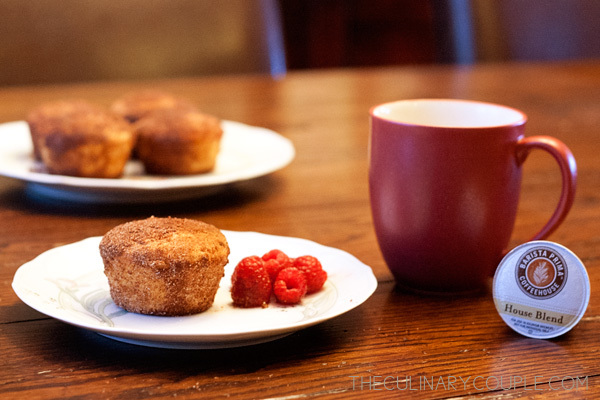 When the muffins are done, roll them in melted butter, then in cinnamon and sugar, coating all parts of the duffin. SOOO easy- WARM GLAZED DONUT!!! While simple, there is no better combination, and no better satisfaction than licking my sticky glazed fingers and washing it down with warm nutty coffffeeeeeee!!! I like Zucchini bread with coffee. I’m a sucker for a good streusely blueberry muffin. 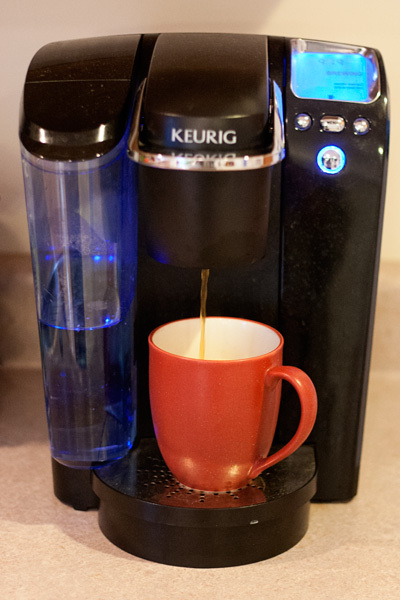 I love trying new k cups, thanks for a fun giveaway! First, don’t include me in the giveaway since we don’t have Keurig over here… However, I still wanted to let you know one of my favorite sweet treats to pair with coffee: One of my favorite coffee shop makes an amazing “cellar cake”. I have no idea, if you know this, but you should be able to find a recipe when you google it. 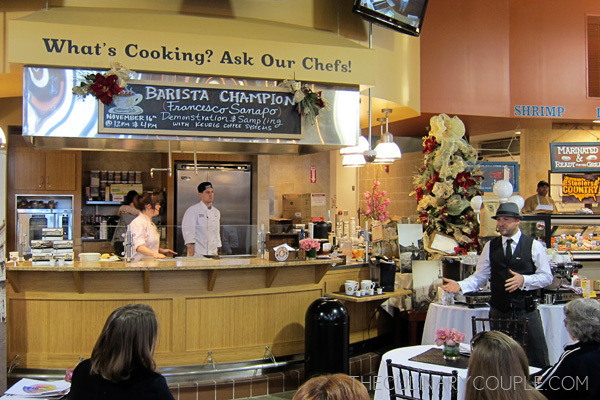 A big bowl of coffee, a piece of cellar cake … sounds pretty perfect to me. Happy Monday! Oh my! Those duffins sound amazing. I love pairing a good cup of black coffee with anything chocolate–chocolate donut, chocolate cake, or even brownies. Going to have to try the duffins! Um…I’m actually not a huge sweets person, but I’ve loved my orange cranberry bread with coffee recently? I looooove a cheese danish with my coffee. I love cookies or lemon layer cake – YUM! I just love a small piece of dark Lindt chocolate! As a fellow toddler mom I’m totally with you on the afternoon coffee! It’s a tough choice but in the morning my favorite coffee paired treat would be some baked french toast and in the afternoon probably a chocolate chip cookie. Thanks for hosting a giveaway! Well, my breakfast this morning was a cup of coffee and a chocolate chip cookie and that was a pretty darn good combo. Breakfast of champions 🙂 We love our Keurig around here too! I don’t love coffee but I do enjoy the other K cup options. My favorite is to drink a chai latte with a toasted waffle topped with a little peanut butter! 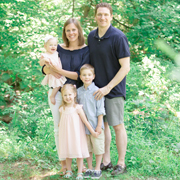 Also, random, but I was googling “wedding favor recipe book” and your blog for Elizabeth Anne Designs came up and as i was reading it i saw the pictures of Nick! To my surprise, my random search brought up a friend from high school! My favorite would have to be a scone – preferably a raspberry white chocolate scone. I love serving my coffee with cheesecake on the side! Shortbread cookies! Yum! Thanks for the opportunity to win! My favorite sweet treat with coffee is shortbread cookies! Not original but I love a dunkin donuts glazed cake donut with coffee. Ate it several times a week during pregnancy and still crave it! I’m not usually a big fan of cookies, but with a cup of good coffee to soften them, they’re just perfect. I like biscotti or good old chocolate-chip cookies best! I love scones with a cup of coffee, or my grandpa’s famous molasses cookies!